Over the past twenty years or so, an increasing number of surgical procedures have been supplanted with minimally invasive approaches. Cholecystectomies are now almost invariably laproscopic, partial lung resections often thorascopic, and now aortic valve replacements are becoming percutaneous. This trend was certainly underway by the time I started medical school, so much so that my surgical clerkship included time in laproscopic surgery training exercises. Though the actual data seems to be conflicting, one statement I often heard was that my generation and those to come would be better prepared to learn these interventions simply because more of our time was spent playing video games. Strangely enough, the argument went, many of the same skills to be good at Mario Kart or Call of Duty were important in manipulating laproscopic surgical instruments. 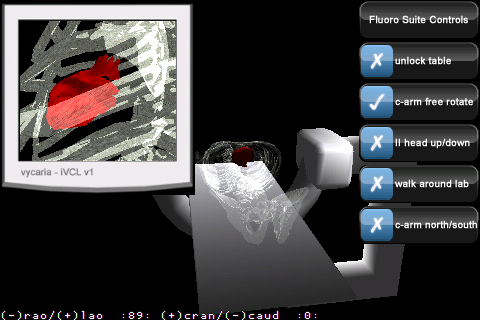 In an odd way, what is being said is that visual-spatial thinking, hand-eye coordination, and other similar skills are becoming increasingly critical with minimally invasive interventions that require the operator to convert 2D images on a screen into 3D anatomy – a skill that means the difference between removing a gall bladder properly verse perforating the bowel. Virtual Cath Lab is a free app that is great example of how medical educational can use new training modalities to prepare trainees for this shift. When performing a cardiac catheterization, the interventionalist must mentally translate a two-dimensional, black-and-white image into a three dimensional heart. Complicated by the fact that there are really no landmarks on the screen to help orient the viewer, it takes a lot of practice and time to learn the different projections and translate them into a usable mental model. But with apps like this, that time can be shortened. The app itself has a very simple interface – basically a C-arm with a “patient” and an inset window with the screen that would be displayed. The user can rotate the c-arm using the touchscreen and will see in the inset window the view of the heart change. Tapping the menu button cycles through several different option menus. The two key ones are the Sequencer and the Fluoro Suite Controls. The sequencer is basically a menu of several standard cath lab views. For someone trying to orient themselves to the black-and-white screen images displayed in the cath lab, this app is quite useful in terms correlating say an RAO caudal projection on the screen to the cardiac anatomy. 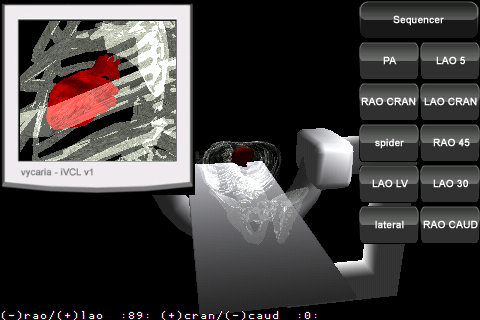 The second main menu involves various cath lab controls, such as the ability to move the table, move the patient, change your viewpoint of the table, and so on. Basically, it gives you a few more options in terms of optimizing the set up to mirror more closely your own learning environment. There are however several points of improvement for this app. The actual coronary vasculature is not displayed on the heart, making correlating the cath lab images to the anatomy a bit more challenging. Also, inclusion of some actual cardiac catheterization images would be helpful in allowing one to practice and learn correlating the images to real anatomy. As medical interventions become increasingly abstract, they will require greater visual-spatial skills as well has dexterity in applying those skills. As such, teaching these skills will require new modalities that shorten the gulf between these newer interventions and the static two-dimensional textbooks and journals that medical trainees currently learn from. All in all, the app is a great example of how the iPhone, iPad, and other similar consumer devices combined with some ingenious developers can really enhance medical education. Virtual Cath Lab is definitely a step up from trying to learn how to use these images from an anatomy textbook, heart model, or other more traditional educational methods. Perhaps most importantly, it is an example of what is likely to be a wave of applications designed to help train interventionalists – its not hard to imagine similar apps for endoscopy, bronchoscopy, laproscopy, and more. We’ve added a link, thanks! I need details about this training facility.